The Rambo Optimo stall is a breathable 0 grams stall. The outer fabric is made of strong and durable 1000D ripstop polyester. The inside is made of polyester lining, smooth material that makes the horse shine. 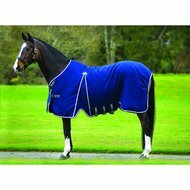 The blanket has a large gusset for lots of freedom of movement, 3 cross surcingles and a leg strap. 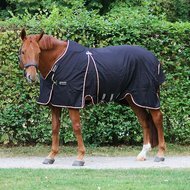 On the withers is a special pad that prevents the blanket from rubbing on the withers or manes, the blanket has a special side closure with 1 hook / eye closure and 1 Velcro closure. The innovative front piece is adjustable so that abrasion on the chest or bottom of the neck can be prevented. The blanket is not waterproof. Beautiful blanket of good quality. The blanket is up to two sizes larger. It could not be better! The blanket has the perfect fit! Comfortable and looks great too. Question: My horse is 1.75 and not very coarse built which size will I have best can order? Question: does this blanket have a tail flap? Answer: This blanket has a tail flap. Question: Is this blanket also available in 200 grams or 400 grams ?? Answer: This blanket is also available in 200 grams and 400 grams. Article code 200gram is 44326683, this is only a different color. Article code 400gram is A1093857. Question: good afternoon, does the rambo optima liner also fit under this blanket? 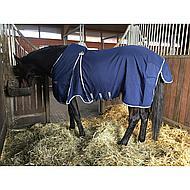 I already have the rambo optimo turnout blanket, do the same liners fit under this stall blanket? Answer: This does not have the fastening on the front like the outer blanket to attach the liner to the blanket. You could then only attach them to the stable blanket at the back. Question: I ordered this blanket last night but can I put another blanket underneath? Answer: This is a stable blanket, it is not waterproof.